Home how to youtube How to Get More Views on Youtube ? Youtube is a platform to grow up your business. This is one of most popular and very effective way to promote business or anything else that you want to reach it world wide users. But the main problem is how to get youtube views. There have many people they are doing good and becoming well known and famous world wide. But most of the people can't get that type of popularity because of low viewers on their Youtube video. Today you can learn here how to get more views on youtube. If you really want to get good views on your youtube video then you should go ahead by following step by step instruction. I see that lots of people upload their video and sharing it on Facebook and twitter but they don't get good result about viewers. Bellow I have shared few effective tips that can help you to boost your views. Before following my all instruction I want to say that this instruction will take sometime to work as effective. You will not see the result instant. But it can help to get that much of huge views very quick if you continue your work by following bellow instructions every time. 1. Perfect Name of Video File: This is very important to give a accurate name of your video file. As like if the video about any game then you should give the name of that games name Ex:"FIFA 16". 2. Video Title: The video title should be engaging and little bit short not too long. If it is about a games game-play then it should be like this "FIFA 16 Game Play". 3. Description of Video: Most us don't care about description of video. But its very important which can seriously can increase viewers. Describe your video using 2 or 3 paragraphs by writing an interesting descriptive information. 4. Use Tags: We always forget about our tags if we are new in this platform even lots of old you tubers also forget. You should use all related keywords about your video. More good tags helps to increase visitors which will come from by searching. 5. Share Video on Social Sites: After complete uploading a video you should share it to all social sites to reach it to more people. More share will help your video to get more viewers. And don't skip sharing for later. Because its important to get quick optimization. Later youtube community can be forgotten to give your video in good position. Timing does matter because its really important. Try to share it on right time like when people available on online as like evenings and weekends. 6. Send Email of your Video: You can create an email lists as much as you can. Try to collect first friends emails then find for other persons who could love to see your video. And send them your video link with a nice massage to encourage them for watch. If you can't collect individually and don't care about annoying people then just send it to as many as people you can. 7. Promote Video using Blog or Website: If you have a website or blog then you can place that video there for marketing. If don't have then you can ask your friends who have a popular site to help you. Share your videos on their website or on Fan page which will generate lots of visitors. You know that on others videos a little bubbles or buttons popping up that says lots of things as like "Subscribe" or "Thums Up!". That called YouTube annotations and these is an wonderful way to increase views of your videos. Using annotations you can link up one video to another and to the play lists of your videos, other links and channel. Which will compelling viewers to watch more videos and will help to promote new videos. Most of the you tubers don't care about the play lists. But I think they should because play lists are most effective way to boost views of your videos. A play lists is a group of list which will help to play one video after one video. The best thing is about play lists is they come up individually in search result. It gives more opportunities to the viewers when they searching for your video. If they like they can be choose to watch your play list. If people want to see more of your video then they may be typically try to watch more. But if it comes automatically one after one then that really help to see more easily to the viewers. That's really effective way increase the visitors because viewers can watch all videos together. These is the best key to get huge views. If anyone subscribe your channel then he or she must be ready for see your new videos. They will check for new uploads or after upload new videos they will get notifications also. The more Subscribers you got the more visitors you will be able to generate. You can learn How to Get More Subscribers on Youtube. There I have described in details about increasing subscriber. Its very important to communicate with fans of your channel. Here another best way is bulletins. It lets you easily send text & videos to all subscribers and bulletins will appear on homepage subscribers. You shouldn't feel shy to send bulletins because it will let subscribers to know when your new videos uploaded. YouTube allows to post video reply to the videos. On any other published video you can leave a video comment which will let you get visitors from that popular videos. That comment will show your video link and will show bellow your video. You can find lots of popular videos and post your video on reply box. Now millions of viewers will see your videos when they will read the comments. You should have to do this wisely. Don't do spam by repeating link share on reply in same video. You can find related video to do this. You need to use rich keywords wisely. More keywords you use into the video, more chances to find your videos on search result. Use an acurate keyword in the title and use several related keywords of your videos in tags. But don't use too many keywords in tags that is one of the big mistakes people always do. Do everything wisely for getting good result. The above instructions you can follow to boost up viewers quickly. Remember by following this instruction you won't see the good result within small time as like instant or 2 or 3 days. Keep doing work same way and wait for the result once you will see that your visitors boost up that you never even think before. Ask viewers for what they do like to see and try to give them their desire one and oviously don't forget to tell them to like & share your videos. This is one of most effective way to promote your videos and channel. 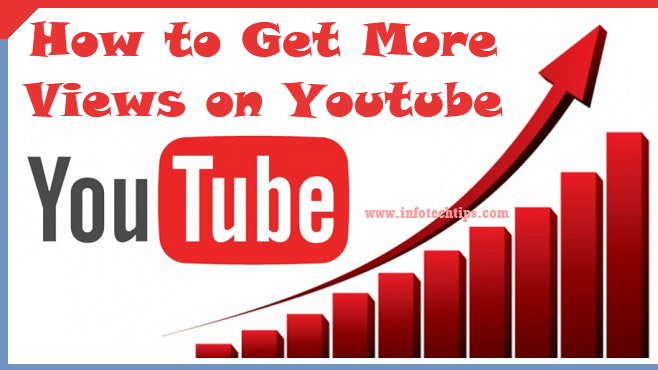 I think my article helps you to know the lots of things about increaseing YouTube views. Keep following the instruction and hopfully you will be able to reach your desire viewers. If you face any problem or want some help don't feel shy to ask me. Like and Share this article to your friends. This can be also helpful for your friends.